Anjal Prakash is the Executive Director at SaciWATERs, South Asia Consortium for Interdisciplinary Water Resources Studies based at Hyderabad in Southern India. He is also the Project Director of ‘Water Security in Peri-Urban South Asia,’ a project funded by IDRC. He has worked extensively on the issues of groundwater management, gender, natural resource management, and water supply and sanitation. 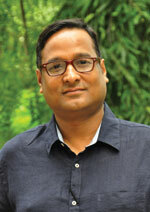 Having an advanced degree from Tata Institute of Social Sciences (TISS), Mumbai, India, and PhD in Social and Environmental Sciences from Wageningen University, the Netherlands, Dr Prakash has been working in the area of policy research, advocacy, capacity building, knowledge development, networking and implementation of large-scale environmental development projects. Before joining SaciWATERs, Dr Prakash worked with the policy team of WaterAid India, New Delhi, where he handled research and implementation of projects related to Integrated Water Resources Management (IWRM). Dr Prakash is the author of The Dark Zone: Groundwater Irrigation, Politics and Social Power in North Gujarat, published by Orient Longman. His recent edited books are Interlacing Water and Health: Case Studies from South Asia (2012) by SAGE Publications and Water Resources Policies in South Asia (2013) by Routledge. He is presently co-editing books on case studies of IWRM and Peri-Urban Water Security Issues to be published by Routledge and Oxford University Press, respectively.